Home / News / 41 Senators Lose Return Opportunity. At least 41 serving senators have lost the opportunity of returning to the Red Chamber for the ninth assembly in June, Daily Trust on Sunday reports. 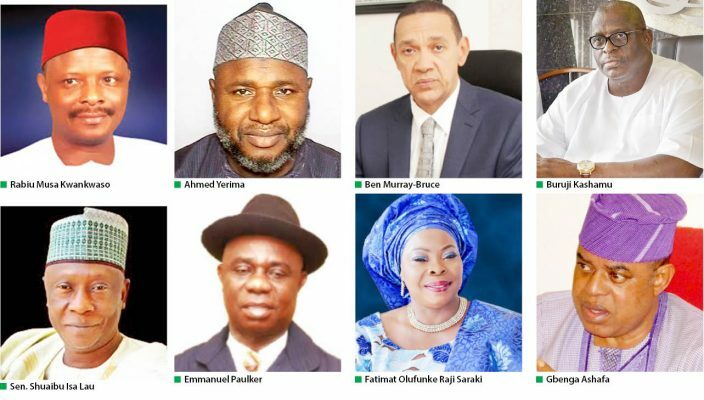 This is based on the list of Senate candidates released by the Independent National Electoral Commission (INEC) on Thursday. The list showed that only 68 out of the 109 senators have chances of returning as they have obtained return tickets of their various political parties. The 41 senators who have lost the opportunity of returning represent 38 per cent of the total number of those currently in the Upper chamber. Daily Trust on Sunday reports that it is not clear if all the 68 senators who got return tickets would win during the February 16 elections. Most of the senators lost their return tickets to others within their political parties, although six among them picked governorship tickets in their states, hence did not contest for return tickets. Those who went for the governorship tickets are; Senators Jeremiah Useni (PDP, Plateau), Sunny Ogbouji (APC, Ebonyi), John Owan-Enoh (APC, C/River), Usman Bayero Nafada (PDP, Gombe), Hope Uzodinma (APC, Imo) and Abdulaziz Nyako (ADC, Adamawa). A few other senators did not seek re-election, hence they did not take part in the primaries. Our correspondent reports that based on the INEC list, a total of seven serving governors got tickets to contest for the Senate. They are; Kashim Shettima (Borno), Ibrahim Dankwambo (Gombe), Rochas Okorocha (Imo), Abdulfatah Ahmed (Kwara), Ibikunle Amosun (Ogun), Abiola Ajimobi (Oyo) and Ibrahim Geidam (Yobe). It was also observed that five former governors who are serving senators are not returning. They are; Ahmed Sani Yarima (Zamfara), Bukar Abba Ibrahim (Yobe), Rabiu Musa Kwankwaso (Kano), Joshua Dariye (Plateau) and Jonah David Jang (Plateau), all of whom did not seek return tickets. The list also showed that the All Progressives Congress (APC) has no candidate in Rivers and Zamfara states. All serving senators from the two states are of the APC. While an Appeal Court ruled that the APC could not field candidates in Rivers State due to certain irregularities, INEC rejected the party’s candidates in Zamfara State, citing lack of adherence to deadline for conducting primaries. But the matter is before a court. Thus, the number of senators who lost return opportunity may be reduced to either 38 or 35 if the matters in one or both states are eventually resolved. Our correspondent observed that all senators from 11 states and the Federal Capital Territory (FCT) got their return tickets. The states are; Abia, Akwa Ibom, Anambra, Bauchi, Delta, Edo, Kaduna, Kebbi, Kogi, Ondo and Sokoto. 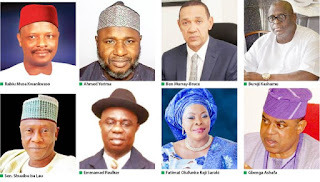 A careful examination of the Senate candidates’ list showed that none of the three senators from Bayelsa State will be returning. Emmanuel Paulker and Ogola Foster lost their return tickets to Diri Douye and Ewhrudjakpo Lawrence respectively while Ben Murray-Bruce did not contest for the ticket despite showing interest initially. Also, the tickets that took the three senators from Ogun State, that is Olanrewaju Adeyemi Tejuoso, Buruji Kashamu and Joseph Gbolahan Dada to the Senate are now being held by Governor Ibikunle Amosun, Adeola Ayoola Sosanwo and Akinremi Tolulope Odebiyi, respectively. Similarly, the three senators from Osun State, namely Olusola Adeyeye, Babajide Christopher Omoworare and Ademola Adeleke will not be returning. They may be replaced by Basiru Ajibola Surajudeen, Famurewa Israel Ajibola and Kamoruddeen Olalere Oyewumi respectively, who now hold the tickets. It was learnt that Adeyeye did not seek re-election. In Plateau State, all the three senators: Jeremiah Useni, Jonah Jang and Joshua Dariye will not be returning. Kefas Peter Dandam, Gyang Istifanus Dung and Hezekiah Ayuba Dimka got the Senate tickets in their place. Sen Husseini has since picked the PDP governorship ticket in the state. In Benue State, Abba Moro picked the Peoples Democratic Party (PDP) ticket to replace David Mark, while Governor Shettima got the ticket to contest for Borno Central seat currently occupied by Sen Baba Kaka Garbai. In Cross River State, Onor Sandy Ojang has picked the APC ticket to replace John Owan-Enoh, while Onu Nwaeze Prince secured the APC ticket for Ebonyi South to replace Sunny Ogbuoji. Both Owan-Enoh and Ogbuoji are APC governorship candidates in their respective states. One senator from Ekiti State, Fatimat Olufunke Raji-Rasaki of the APC lost her ticket to a former member of the House of Representatives, Opeyemi Bamidele, while Gilbert Nnaji of the PDP from Enugu State lost his ticket to a former governor of the state, Chimaroke Nnamani. From Gombe State come Governor Hassan Dankwambo and Binta Bello, a serving member of the House of Reps, who have secured tickets to take the seats of Senators Usman Bayero Nafada and Joshua Lidani respectively. And in Imo State, Governor Okorocha and Onyewuchi Francis have secured tickets to replace Senators Hope Uzodinma and Sam Anyanwu. The two serving senators from the state contested for governorship tickets in APC and PDP. Uzodinma got his party’s ticket, but Anyanwu was not successful. In Jigawa State, Danladi Abdullahi Sankara now has the APC ticket to battle for the seat currently occupied by Sen Abdullahi Abubakar Gumel, while Aliyu Sani Madaki, a House of Reps member, picked the ticket for Sen Rabiu Musa Kwankwaso’s seat in Kano. Senator Abu Ibrahim of Katsina South, who did not seek re-election, will likely be replaced by Bello Mandiya, who got the ticket while Kabir Abdullahi Barkiya got the ticket for Katsina Central to replace Sen Umaru Ibrahim Kurfi. In Kwara State, Governor Abdulfatah Ahmed, who was reported to have ceded his ticket to Senator Rafiu Ibrahim, has his name as the PDP candidate for Kwara South, while Zakari Mohammed, another House of Reps member, picked the ticket for Kwara North to contest the seat of Sen Shaba Lafiagi. Sen Gbenga Ashafa from Lagos State will not be returning as Osinowo Sikiru Adebayo picked the APC ticket for his seat, while John Michael Abdul picked the PDP ticket for Nasarawa North to replace Sen Philip Aruwa Gyunka, who had contested for the governorship ticket. Of the three senators from Niger State, Sen Mohammed Garba lost his return ticket to Muhammad Enagi Bima. In Oyo State, only Senator Rilwan Adesoji Akanbi will not be returning as Governor Abiola Ajimobi picked his ticket. Sen Isa Lau from Taraba State will be replaced by Bako Dahiru Gassol, while Governor Ibrahim Geidam of Yobe State now holds the ticket that took Senator Bukar Abba Ibrahim to the Upper chamber.